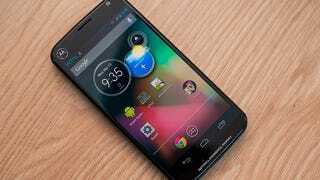 Does This Mystery Motorola Reveal Google's Influence? A mysterious new phone, which purports to be a Motorola-made Android, has surfaced—and it appears to shun the usual Moto design aesthetic in favor of something a little more Google-inspired. The guys at Tinhte got their hands on the phone. It's worth pointing out that its specs don't seem to be targeting the very high end: there's a 4-inch 720p screen, an Adreno 320 GPU, 2GB of RAM and a 2,000mAh battery. That suggests that it's not the fabled Moto-Goolge X-Phone, and would also seem to confirm Google's recent claim that Motorola's upcoming hardware is "not really to the standards that what Google would say is wow-innovative, transformative."